East Coast Railway (ECoR) is planning to provide free Wi-Fi at some small stations like Damanjodi and Tikiri with the help of corporate houses and public sector undertakings (PSUs). Local students and youths (mostly belong to small towns and rural areas) will get benefit of the service, said ECoR sources. The Railways has a provision to provide Wi-Fi services to A1, A and B category stations. “But there is no such policy to provide this facility in small stations. So the ECoR has decided to make some small stations Wi-Fi enabled with the help of local industries and business houses for the benefit of the locals,” said ECoR chief public relations officer JP Mishra. Presently, A1 category stations, Bhubaneswar, Puri and Visakhapatnam, and A category stations like Cuttack, Khurda Road, Sambalpur and Vizianagaram have Wi-Fi facility. The Railways has started process to provide Wi-Fi facilities to B category stations like Paradeep, Balugaon, Chatrapur and Bargarh Road. The ECoR has identified some stations under the jurisdiction of three railway divisions- Khurda Road, Waltair and Sambalpur. These stations are-Mancheswar, Barang, Kendujhargarh, Jakhapura, Talcher Road, Chilika, Bhawanipatna, Lanjigarh, Ambadola, Singapur Road, Bissamcuttack, Hirakud, Badmal, Jeypore, Jharsuguda Road, Tikiri, Damanjodi, Kottavalasa, Kirandul and Garividi. All these stations are situated near different industries and corporate houses. The corporate houses can provide fund from their corporate social responsibilities (CSR) fund to provide these facilities in the stations, said the ECoR official sources. Besides, the corporate houses and PSUs, the local volunteer or social organisations can also sponsor the project. “Even individuals like MLAs and MPs and business persons are welcomed to tie up with us,” said Mishra. As per the procedure, the zonal railways will install the Wi-Fi hardware at the station, while monthly recurring cost to the telecom provider will be sponsored by the organization. ECoR has already installed a Wi-Fi system at Bissamcuttack station in Rayagada district. Testing of the service is underway. Four local organisations have come forward to sponsor the project in the station, official sources said. “If any corporate house interested to provide this service at their nearest stations, they can contact the concerned divisional railway manager of the railway division,” said Mishra. Union Minister of State for Railways Rajen Gohain flagged off the Rajdhani Express from Agartala railway station in presence of Governor Tathagata Roy and other dignitaries here on Saturday ending a long wait of around 53 years.It was 1964 when the first metre-gauge train reached at Dharmanagar, State’s extreme subdivision with Assam’s border. Gohain and the Governor flagged off the superfast train at 2.30 pm amidst cheers and joy as large number of people assembled at the station to witness the historic moment. The Union Minister said that it is a good beginning for the people of Tripura as they have Rajdhani Express to travel to Anandvihar (Delhi) within shortest period of time. “We used to hear that there is a need to give due importance to the North-east but nothing has been done for the backward region. But, during the past three years, especially under the leadership of Prime Minister, there has been a mark improvement in the connectivity- railways and road”, he said. “Tripura has been a front runner when it comes to railway expansion in the region over the past three years”, he said. Asserting that there is no dearth of fund for executing railway projects in this region, Gohain said officials were asked to speed up the railway projects taken up as sufficient funds are available for this purpose. “Modiji doesn’t believe in political colour when it comes to need of a State. In Assam, the Centre has given Rs 2,000 crore for flood relief and Rs 200 crore was earmarked separately for study the cause of floods in Assam and find ways to prevent this”, he said. Gohain said Union Minister of Railways Pijush Goyal would be on a three-day visit to the North-east starting from November 3 to take stock of the railway projects. “If you have any demand, you can place before Goyalji during his visit to the State”, he added. In his speech, the Governor lauded the Central Government role in speedy expansion of railway network in Tripura and other north-eastern States over the past three years. The Vice-President of India, Shri M. Venkaiah Naidu awarded Ministry of Railways, for outstanding contribution in IT initiative for Transparency in the organization, for creation of an IT enabled organization wide infrastructure in railway tendering and contractual matters to enhance transparency and clarity in processes, today (i.e.30th October, 2017) at Vigyan Bhavan. Minister of State for Development of North Eastern Region (I/C), Prime Minister’s Office, Personnel, Public Grievances & Pensions, Atomic Energy and Space, Dr Jitendra Singh, Cabinet Secretary, Shri P K Sinha, Chief Vigilance Commissioner, Shri K V Chowdary, and other dignitaries were present on the occasion. The award was received by Shri Rajaram Prasad (GM/MMIS/CRIS). This award programme at Vigyan Bhawan was organised by Central Vigilance Commission as a part of Inaugural function of Vigilance Awareness Week-2017. As a result of this IT initiative, Railways has been able to achieve 100% e-tendering for procurement and 100% e-auction for disposal of scrap in a secure, transparent and easy manner, with information and status accessibility to all the stakeholders at the click of a button. This has substantially mitigated the risk of corruption involved in these areas, simultaneously providing the environment of Transparency, Ease of doing business and Fair Business Practice. Indian Railways’ e-procurement portal (IREPS) is the largest e-procurement platform in India handling almost 2/3rd of the total Government tenders. During financial year 2016-17, IREPS has successfully handled 3.36 Lakh e-tenders. IREPS successfully handled e-Auctions for 31726 lots (2638 catalogues) during 2016-17. It has over 67,900 registered vendors, over 2,800 registered bidders and over 10,000 railway users. 95% of all the applications run on Indian Railways were designed, developed and successfully commissioned by Centre for Railway Information Systems (CRIS) – an IT Arm of Indian Railways. After nearly 18 months, the famed 110-year old Matheran Toy Train resumed partial services on Monday, after it was suspended in May 2016 following several derailments, a top official said. 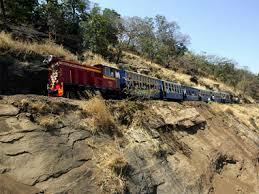 “The train resumed services on the critical Matheran-Aman Lodge sector, around 3.5 kilometres distance. We are planning to restart services on the entire 21-kilometres Neral-Matheran route as soon as possible,” Central Railway (CR) CPRO Sunil Udasi told. From Monday, the CR started 12 shuttles daily on the route. It started from Matheran at 8.50 am and in the return direction from Aman Lodge at 9.25 am, in what is Asia’s only automobile-free hill station nestled in the Western Ghats, around 110 kilometres from both Mumbai and Pune. To ensure passenger safety, the CR has introduced enhanced safety features in the toy train ‘Phul Rani’, and replaced the original manual brakes with the safer air brakes system. In the original system, there was manual braking in which six brake porters applied the brakes in sync and any time lag between could cause an accident. Under the new air brake system, the train driver can now slow down or apply the brakes as required without the involvement of the brake porters. Udasi said that the final trials to check the safety and operational issues before top officials were conducted on Sunday before giving the green signal to resume operations from Monday. The resumption of services would prove a boon to the local residents and tourists to Matheran as the winter peak tourism season has started and they were forced to cough out exorbitant amounts to hire horses or carts. The other option for the able-bodied people was to walk the steep route from Matheran to Dasturi Naka, the termination point for all vehicles outside the hill station precincts. The narrow guage toy train is considered a marvel and ascends in a crazy zig-zag (with more than 280 steep turns) from Neral to Matheran, around 2,500 feet from sea-level, offering breathtaking views of the lush green and steep hills and deep valleys, highlighting the beauty of the hill station. The toy train was built by a Mumbai industrialist, the late Sir Adamjee Peerbhoy at a staggering cost of Rs 1.60 million in seven years, between 1901-1907. The hill railway contributed in a big way to the growth of Matheran and forever changed the face of the tiny hill station, after it was discovered in May 1850 by the then Mumbai Collector Hugh Poyntz Malet. Inaugurating a three-day Global Mining Summit here, Goyal said Jharkhand was on the path of development and Chief Minister Raghubar Das had responded to the Maoist menace positively. Transgenders will now have the option of identifying themselves as the third gender with the Railway Board modifying reservation forms to provide the option ‘T’, besides ‘M’ (Male) and ‘F’ (Female). The Railway Board in a letter to all zonal railways has said that ticket booking and cancellation forms will be modified from the current option of ‘Transgender (Male/Female)’ to just ‘T’. According to the letter, the social justice and empowerment ministry is at present dealing with various issues of transgenders and a proposed legislation on this — The Transgender Persons (Protection of Rights) Bill, 2016, is being reviewed by a parliamentary standing committee. “The matter has been reviewed and it has been decided that till such time the detailed modalities on this account are finalised by the Ministry of Social Justice, a provision may be made in the system to capture the gender of transgender as ‘T’ instead of ‘T(M/F)’ as advised earlier,” according to the October 17 letter. In a landmark judgement in 2014, the Supreme Court created the ‘third gender’ status for hijras or transgenders. Following the order, many government documents such as passport, ration card, bank forms and voter identity cards have started providing ‘TG’ (third gender), ‘Other’ or ‘T’ (transgender) as options. The railways introduced the option as ‘T(M/F)’ through an order in 2016 which, activists said, still forced them to choose between the binary genders — male or female. The Railway Board said in its review it had also taken into consideration directions of the Kolkata High Court which had asked State Bank of India to allow the choice of third gender in its application forms for recruiting new employees. This case pertains to a case filed by Atri Kar, the first transgender from West Bengal to appear for the civil services exam, who sought the court’s intervention to enforce her right to participate in the selection process of SBI as a transgender. The Railway Board also said that the Centre for Railway Information Systems (CRIS), an autonomous organisation under the Ministry of Railways, will make necessary changes in the software for giving the option of transgender (T) alongside the option of M/F in the passenger railway system under intimation to all zonal railways, the letter said. The Central Railway will be cancelling the Pune-Solapur-Pune Intercity Express train (train nos. 12169 and 12170) from November 1for the next 125 days, causing much trouble for passengers travelling along the route. While schedules of several other trains on this route have been changed, the reason behind this cancellation is that the railway track work between Washimbe and Jeur on this route will begin from November 1. Every day, one hour 45 minutes during the afternoon will be set aside for this track work. As the Intercity Express is a major mode of travel for students, office goers and other passengers, they will suffer the most for the next four months. “Currently, it is a single line railway track on the Daund-Kurduwadi-Solapur route. So, work will start in the first phase on the Washimbe to Jeur stretch for development of the track. For this, daily, a one-hour-45-minute block will be taken by our workers on this route to carry out the work. So, all trains running in the afternoon are being either cancelled or delayed. Other than the Intercity Express, the Sainagar-Pandharpur-Sainagar train that runs thrice a week has also been cancelled. We will be trying to complete the work as early as possible, but the estimated time needed for it is 125 days according to our calculation,” said senior commercial manager of Central Railway R K Sharma. A long wait of passengers from Chakradharpur to travel on the Bhubaneshwar- New Delhi Rajdhani Express is over. The train will travel via Chakradharpur railway station on every Saturday from February 10 next year. This change has been made in the new railway time table of South Eastern Railway ( SER) which will be effective from November 1. As per the plans, on Saturdays starting from February 10 the train will leave Bhubaneshwar at 7.10 am and it will reach Chakradharpur railway station at 4.20 pm the same day. The train will reach New Delhi the next day at 10.40 am. On its return journey the train will leave New Delhi at 5.05 pm every Sunday ( with effect from February 11). The train will reach Chakradharpur the next day at 10.37 am. It will reach Bhubaneshwar at 8.35 pm the same day. Chakradharpur is the highest revenue earning railway division in terms of freight in the country. Railway officials said that commensing February 10 on every Saturday he train will travel via Sambalpur,Jharsuguda, Rourkela and Chakradharpur. “It has been long waited demand of the people of Chakradharpur. The town has been included in the route of Rajdhani Express keeping in view the demand of passengers,” said an official of Chakradharpur Railway Division. Moreover, the new railway time table one pair of Weekly Humsafar Express between Santragachi and Pune every Saturday and leaving Pune every Monday will be introduced. The train will travel via Tatanagar railway station. The date of introduction of the train will be notified later. Similarly, another weekly Humsafar Express train between Santragachi and Jabalpur leaving Santragachi every Thursday and Jabalpur every Wednesday will be introduced. Pune rail division officials have revealed that the works to develop the Hadapsar railway station into a full-fledged terminal will begin in a couple of months. A tender for the first phase of the project has been floated and bidder submissions will be opened in a fortnight. The new terminal will allow Pune Junction to expand its operations by adding more trains to different destinations from the city. “Hadapsar already has a railway station. The plan is to develop it into a proper terminal. We expect construction to begin by January, and the works to be completed by mid-2019,” a senior official of the division told. “Phase one of the project involves the extension of the existing platforms to full coach length. Also, an additional platform will be erected at Hadapsar, bringing the total number of platforms at the station to three. Passenger amenities will be created as well. Work on this phase will begin soon. A decision on the second phase will be taken in the near future as it involves more work and land acquisition. We will have to study and calculate the extent of land that needs to be acquired. Currently, we will be focusing on phase one,” the official said. Another official said that apart from some new trains, most of the north-bound trains from the Pune Junction will be shifted to the Hadapsar terminal. “The Pune station has become congested. The new terminal will reduce the load on Pune station. Though a final decision on the trains is awaited, the plan is to shift the originating point of all north-bound trains to the new terminal. Also, once the project is ready, trains to new locations can be run from Hadapsar. With the city expanding, one needs a proper rail terminal and Hadapsar is the answer,” the official pointed out. Passengers, however, are in two minds. “Rail projects take a lot of time. If they are planning to shift the north-bound trains to Hadapsar, other infrastructure like roads leading to the station, proper connectivity to the station etc. need to be considered too,” said Ankur Singh, a Bihar native. The railway authorities had said that the total cost to develop Hadapsar station as a rail terminal would be about Rs23.94 crore, but since the project got delayed, the cost went up.